If you’re keen to enhance your online presence, you should be paying close attention to e-mail lists. Subscribers can play a pivotal role in making your blog a long-term success, but you do need the right tools to create a useful and valuable list. MailChimp is one of the world’s top e-mail service providers, whilst WordPress is the most popular CMS on the planet. These tools can both support us in our quest to create a subscribers list. There are many trusted e-mail service providers on the market, so what makes MailChimp so special? Not only is the plugin free to use, it has a simple email subscription widget and there’s little to no chance of you facing issues with corruptions or compatibility. Designing an email and setting up a campaign is also easy, and you can manage your campaigns either from the WP or MC sides. There are many different analytics to look at, allowing you see the different ways your audience responds to different kinds of media. You can also use A/B testing to find new ways to serve them more efficiently. 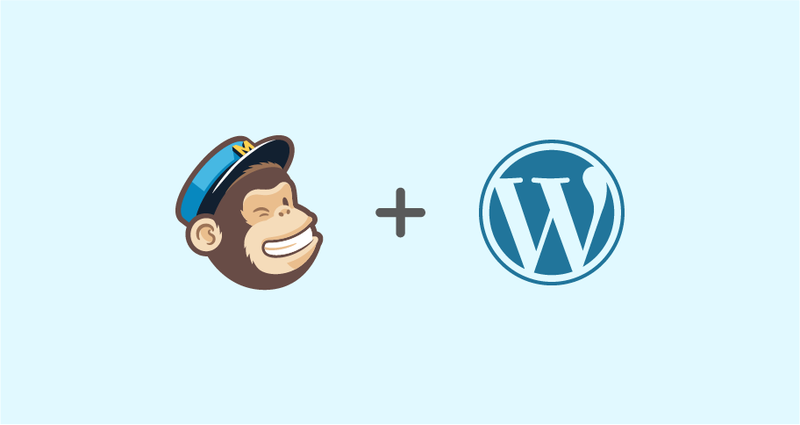 To get started, you will need to get the MailChimp plugin from the WP plugin page, download and install it. You will need to activate the plugin. You can also get the plugin from your dashboard. Just go to Plugins>Add New and type MailChimp for WordPress into the search box. You will need an API key if MailChimp is to function. Make sure you click on the “Get your API key here button. Once you have clicked to get your API key, you will be taken to the MailChimp site. Once you have registered you will have access to the key. You then need to copy and paste it into the plugin dashboard. After you have taken these steps, you can start creating your e-mail list, which will help you keep track of subscribers. You will need to add details including company name, address and other information. There is a notification section beneath the form. You can have the notifications sent to9 any of your e-mail addresses. These notifications will tell you about user activity and let you know when someone has subscribed or unsubscribed. It is wise to opt for a daily summary to stay in the loop without being bombarded with notifications. You can create a signup form by using the down button on the generated list. To make sure this form appears on your site, you need to go to the widget section and click on Appearance> Widget to make a text widget. Give your widget a simple title and put the code into the widget area. This code will activate the widget. If you need to import an old subscriber lists to your MailChimp account, you can export the list in CSV format or as a delimited text file. Upload the file to MailChimp and edit necessary fields. MailChimp also makes it easy to create and send out newsletters. The templates allow you to build newsletters within moments and distribute them with just one click. You can use the Create Template button for creating a template and follow the instructions. The template will support drag and drop. The campaign can be orchestrated with a wizard. MailChimp has four campaign types including regular, plain-text, A/B testing and RSS campaigns. Once you are ready, you can send the newsletter and press the confirm button to finalise everything. MailChimp will tell you if it finds any errors. You can schedule your campaign by setting the date and time. Paid users can also take advantage of other options including Batch Delivery, Timewarp and Send Time Optimization. MailChimp is widely agreed to be one of the finest newsletter service on the market, and is a great match for WordPress. WP and MC have large active communities that can help you if you ever do run into problems whilst using them or integrating them with one another. WordPress has been the most popular CMS on the market for many years and is extremely SEO-friendly. In fact, it’s said that the main search engines including Google look very favourably upon sites that have been created with WordPress. WordPress is open source software that is free to use, free to edit and free to distribute. The vast majority of leading hosting companies offer one-click installation of WordPress. It’s always a good ideas to ask about WordPress service before you commit to a hosting package. There are many great reasons for opting for MailChimp too, including the way that enables you to send out newsletters to Twitter followers with one click.